Great overview for those who are interested in Thrift’s work. He is a curious figure in academe. There is increasing interest in practice and performance in cultural geography. 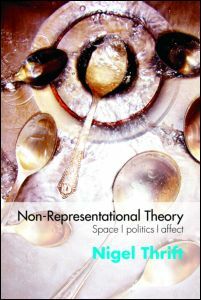 Attempts to move beyond issues of representation and re-focus cultural geographic concerns on performativity and bodily practices are linked to the inception of what Nigel Thrift describes as ‘non-representational theory or the theory of practices’ (Thrift 1996, 1997, 2000a, 200b). According to Thrift, the non-representational project is concerned with describing ‘practices, mundane everyday practices that shape the conduct of human beings towards others and themselves in particular sites’ (1997: 142). Rather than obsess over representation and meaning, Thrift contends that non-representational work is concerned with the performative ‘presentations’, ‘showings’ and ‘manifestations’ of everyday life (1997: 142).